Skyrail opened to the public on 31 Aug 1995. 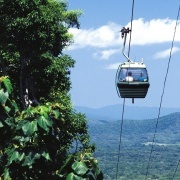 The cableway was originally installed with 47 gondolas, giving it a carrying capacity of 300 people per hour, however a $2.5million upgrade completed in May 1997 increased the total number of gondolas to 114 and increased the carrying capacity to 700 people per hour. 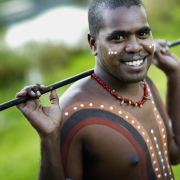 Stretching 7.5km through the tropical rainforests of North Queensland, Skyrail provides people with a unique opportunity, and a world first, to see and experience the rainforest in a safe and environmentally friendly way. 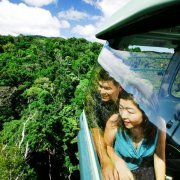 In December 2013, Skyrail introduced 11 Diamond View glass floor gondolas which seat 5 people and offer yet another amazing perspective of the rainforest below. 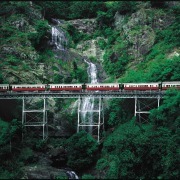 When construction of Skyrail was completed it was the world’s longest gondola cableway at the time. The Skyrail project and construction required world first construction techniques and even today Skyrail Rainforest Cableway remains the most environmentally sensitive cableway project in the world. 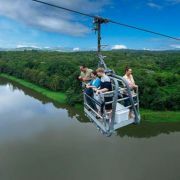 After a 10-year benchmarking and certification programme, Skyrail is the first in the Pacific Region to obtain EarthCheck’s Certified Platinum rating and the only cableway in the world to achieve this status. Skyrail is committed to continual improvement of sustainable environmental performance. 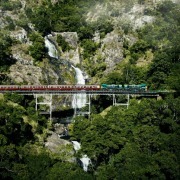 Skyrail has achieved Advanced Ecotourism and Climate Action Innovator certifications. These independent assessments recognise Skyrail as an innovative leader, committed to environmental best practice and conservation and providing guests with the opportunity to learn about the environment.